I am certified by the only 2 organizations that provide educational courses/training and testing to do third party / independent Stucco & EIFS inspections. I’ve also been performing stucco inspections as long or longer than anyone in southeastern Pa. Experience is a critical component of being as accurate as possible with invasive stucco testing. I am also a Level II Infrared Thermographer. Infrared- a heat-sensing camera can be a useful tool to help locate “evaporative cooling” which can cause a thermal pattern indicating the presence of moisture. See the “Infrared Evaluations” page. There are many types, variations or combinations of stucco and EIFS. 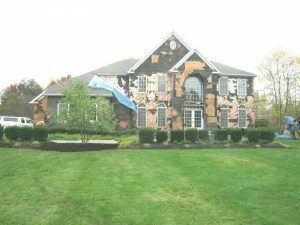 (EIFS – Exterior Insulation Finish Systems) Many people don’t realize that the “fake / manufactured” stone on their houses is also just another method/type of stucco. But they can all have similar problems. For the purpose of this information, I will refer to it simply as the most commonly known name “stucco”. As an ACI Certified Home Inspector, I have been warning clients for years that there may be significant moisture-related damage under the stucco that cannot be seen during the visual inspection they get before they purchase a house. When I inspect a stucco house there are immediate concerns, additional disclaimers, and a call for a full invasive investigation, in my report. Why? Because a large number of stuccoed houses have serious problems and unfortunately, these problems are hidden inside the walls and cannot be seen because they are simply not visible. This concern has finally come to light. The request for an invasive stucco inspection along with other inspections is becoming standard practice with buyers. If you are a buyer purchasing a stucco-clad house and you don’t require one, you are taking a significant, potentially very costly, risk. Failure rates of stucco-clad walls are estimated to be somewhere between 50 and 80 percent. This includes manufactured / cultured stone which is simply a different finish coat of stucco. If you have, or know someone who has a house with stucco or manufactured stone on frame exterior, that was built in the last 20 years, reading this and taking action may save you tens of thousands of dollars and immeasurable stress. 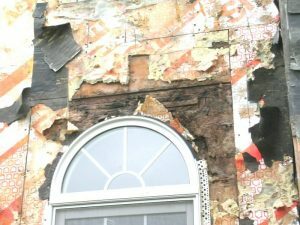 Joe Listiburek, Ph.D., P.Eng., a well-regarded expert on building science has labeled eastern Pa. “The stucco failure capital of the United States”. Some developments have a 51% failure rate. Why? There are a number of reasons. We have made our houses tighter but we didn’t make adjustments for moisture entrapment and vapor movement. We have added more windows. We use central air more then we used to. We have changed many building materials without making necessary changes to construction methods. There are many other reasons but perhaps the biggest problem is poor workmanship. Often because of a lack of understanding building science. It’s not stucco, it’s the installation of the stucco that is the problem. If the stucco was installed properly, it is a good, durable, attractive exterior wall cladding. During the last building boom, builders could not get help, much less qualified help. So unqualified workers were incorrectly installing (or eliminating) critical details required to prevent moisture intrusion behind stucco on frame. I have seen improperly installed, or the lack of, a $5 piece of flashing result in the need for 10 thousand dollars of repair. All exterior sidings leak. 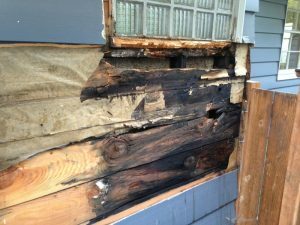 However, unlike other siding material, where generally there is sufficient air flow to evaporate water that gets behind the siding before significant deterioration occurs. Water that gets behind stucco can become trapped where it can cause rot and mold. Stucco has been around almost forever. If installed by knowledgeable, caring, consciences, tradespeople can be an excellent siding/wall cladding. My opinion is that the problems are primarily caused by poor installation. But, there are other factors listed below that have also contributed to the problem. • Contractors and POOR WORKMANSHIP !!! I own a house with stucco or manufactured stone. I’m not trying to scare anyone. But, in all honesty, if you own or are considering a stucco-clad house, you should be concerned. I’m seeing unknowing homeowners that have done nothing wrong, being blindsided with repair/ replacement cost of many tens of thousands of dollars when they go to sell their houses. I’ve seen the damage behind seemingly perfect stucco-clad walls. I have found problems where the repairs exceeded $200,000. Moisture intrusion behind stucco is like cancer that continues to grow. Unfortunately, determining if your stucco has a problem cannot be done with a visual only inspection. 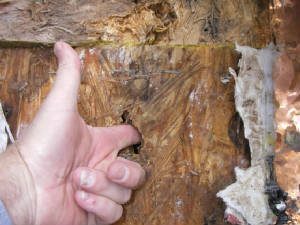 The exterior of your house may look perfect but there may be severely rotted wood wall framing. Infrared can be helpful but it will be inconclusive and any good Thermographer will tell you that what is found with infrared needs to be confirmed by an additional testing method. It is a helpful tool but you don’t want to assume your walls are OK or not OK with infrared only. The only way to determine if there is a problem is with an invasive inspection. Invasive because it requires drilling small holes at critical locations to determine the moisture content at the surface of the exterior wall sheathing under the stucco. Sounds ugly but the holes are small, filled with caulk, don’t do any damage, and if not immediately, over time disappear from sight. Most of the time I cannot find the holes when I go back to touch them up. This inspection should be done by someone with the proper training/certifications. Preferably one with extensive knowledge of houses and building science. Additionally, it should be done in accordance with an established protocol. If second opinions are obtained the results should be similar. If you are selling your house, your options are much more limited. You can be proactive and have an evaluation. Know what to expect and be prepared. If problems have been found by your buyers’ inspector and the buyer wants it fixed, get a second opinion before you start ripping the stucco off. But once a buyer is involved and you are confined by the time limits the real estate transaction puts on you, the buyer may be in control. You can, however, get a second opinion and perhaps suggestions that will limit the expense. Most contractors simply want to rip and tear, when repair/ improvement/ surgical patching may be all that is necessary. and have time, you have more options. There are things you can do now, to prevent major losses when the time to sell comes. But, again, first, you have to find out what the current condition of your stucco is. What is happening behind / under your stucco? Then you can evaluate your options and decide which one is best for your house. If your moisture readings are within the acceptable limits, follow the recommendations in the report to keep it dry. And, when you sell your house put the report on the dining room table for the buyer to see. There is even a warranty available for purchase if your stucco is OK. The sooner you find out about it, the less extensive the damage will be and the less expensive the repairs will be. 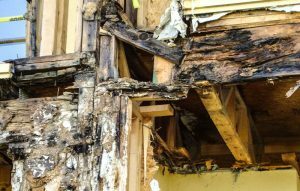 On countless occasions, I have found damage that I know, if it had been found a year earlier, could have been fixed with pennies on the dollar compared with what the owner ended up paying when they went to sell their houses. One example of this is a complete tear off at cost of $60,000 (that’s right, 60 thousand dollars ) that could have been addressed with $5,000 in repairs. If only I had been called in before the house was listed. People tend to think that the exterior wall cladding/siding is “waterproof”. However, there are no “waterproof” wall claddings/sidings. They all allow water/moisture to get behind them. If this water/moisture is not collected and managed properly it will enter the wall structure and potently cause serious damage. 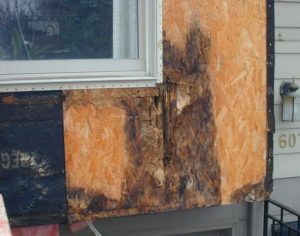 This is why, as I explain in my inspection reports, the installation of whats behind the siding is so important. The flashing, the sealing, the drainage plain, the WRB moisture resistant barrier, the building paper, are just of few of the items that may or may not be behind your siding. If they are and they were installed properly and managing the water properly, your OK. But if they are not or if they were not installed properly or not performing adequately, you will have problems. 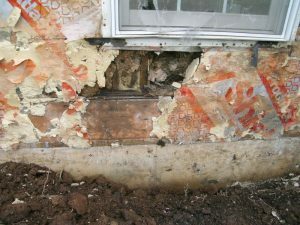 Water gets behind the stucco, into the wood framed wall structure becomes trapped, and causes rot and mold. This is largely due to poor installation and the lack of properly installed details that are necessary to keep water out. These problems are not unique to stucco but the nature of stucco increases the potential for damage. The houses built during the last building boom are plagued with poor workmanship and premature failure. Things that should last 50 years need replacement in 8. Perhaps you have experienced or heard from your neighbors about leaks occurring, or wondered why that house across the way is having its siding ripped off. The builder may have come back and “fixed the problem” but it was likely only a band-aid that will temporarily cover a much larger problem. Usually, there are no visible signs of a problem until significant damage has already occurred. For several years now, when clients call me for a home inspection, I have been asking what type of siding the house has so that, if it has stucco, I can immediately make them aware of the potential problems and/or recommend that they keep looking. Realtors are reluctantly becoming aware of this problem and in some cases steering their buyers away from stucco-clad houses. This problem and the awareness of it, by home inspectors, realtors, and the general public is only increasing. It is likely that when you sell your house, additional evaluation will be recommended by even a minimally knowledgeable home inspector and chances are, problems will be found. Let me show you how important it is to understand the potential problems that your stucco may have. Below is a picture of a very nice looking stucco sided house. To the naked eye and even to a qualified home inspector there may be no visible evidence of any problems. Looks great, doesn’t it? Now scroll down and see what’s happened under the stucco. Providing Property address might help expedite things. © 2019 shinspections.com. All RIghts Reserved.